Pulitzer Prize-winning reporters M.L. 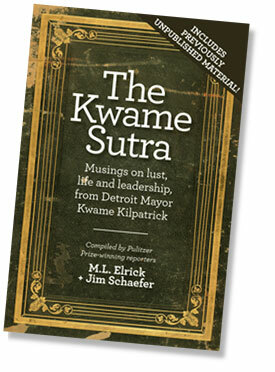 Elrick and Jim Schaefer of the Detroit Free Press have released a new book entitled, The Kwame Sutra. It is, according to Drew Lane of WRIF-FM, "a one-stop shop for all of Kwame's best BS." This new book captures Kwame M. Kilpatrick as no one ever has. In his own words, including never-before-published quotations, this former mayor of Detroit reveals himself in many ways as a liar, a Lothario and, yes, a leader. Mr. Elrick and Mr. Schaefer will sign copies of their book at Hugh (2233 Park Ave.), which is a new men's boutique in downtown Detroit - right behind the Fox Theater. They will be there this coming Tuesday, December 15, at 9 p.m. I met Mr. Elrick and Mr. Schaefer at the Anchor Bar (450 W. Fort) once. I was there late one night with some friends and they came in after working late at the paper. I look forward to seeing them again and, in particular, to reading this book.